The Gravenstein apples are becoming ripe back home, so now is a perfect time to share this easy slow cooker apple sauce (or apple-pear sauce) recipe with you! Applesauce is one of the my favorite comfort foods from childhood. We updated my mom’s version so that you don’t have to peel, and you can use the slow cooker so if you need to leave the house, you don’t need to leave simmering apples on the stove. To make this slow cooker apple sauce, you can cut up fruit when it is in season, and freeze the harvest. Then when you want to enjoy the smell and taste of autumn in the country, just pour the frozen apple pieces in the slow cooker, add a little water and a sprinkle of cinnamon if desired, and let it cook on low all day. Right before dinner quickly run the immersion blender through it, and it’s all ready to serve (above this apple sauce is served with zucchini lasagna) for dinner. Three is no peeling, there is no reason to heat up the house in August making gallons of this sweet sauce, and you can use a combination of whatever fruit you have- apples of course, but also peaches or pears make a delicious addition. Because the pieces of apples don’t need to be perfectly uniform, this is a perfect beginning cooking project for young children. 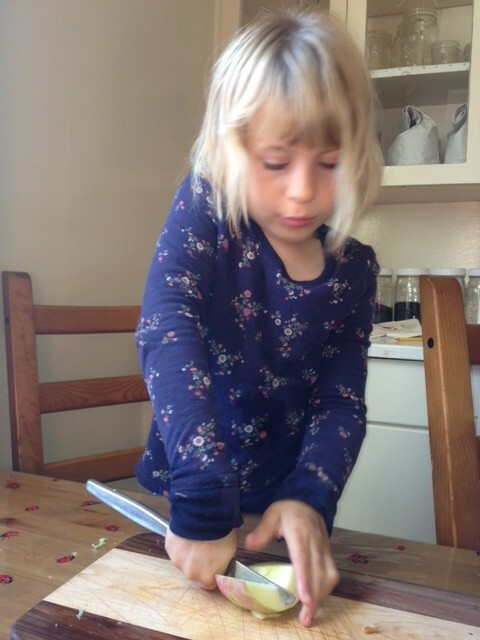 Butter knives can be used, or it can be a great first sharp-knife project for older children. No need to peel- we puree the peels in later for added nutrition and to save work. 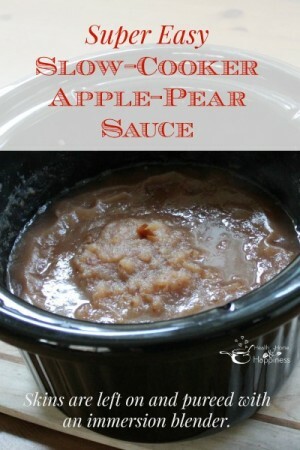 This slow cooker apple sauce is sure to become a family favorite! Rinse fruit. I like to scrub the sink, then fill it with water and fill it with fruit, then cover with water. This really loosens any stuck on dirt. Core apples and pears, remove pits from stone fruit. Cut into bite-sized chunks (cut apples into about 8 pieces), there is no need to peel. Fill a slow cooker 3/4 full with these chunks of fruit, add 1/2 cup water. Turn slow cooker on low and cook, covered, all day (6-10 hours) or until fruit is soft. Use an immersion blender to puree fruit. *The small chunks of fruit can be frozen in a gallon zip-top bag for up to ~4 months and you can put the frozen fruit directly into the slow cooker, add the water, and cook on low. It may take the longer cooking time when doing this with frozen fruit. 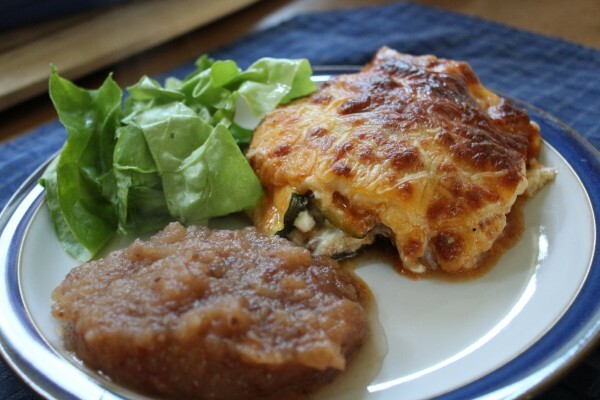 This is a recipe from our Freezer-to-Slow Cooker Cooking Class! 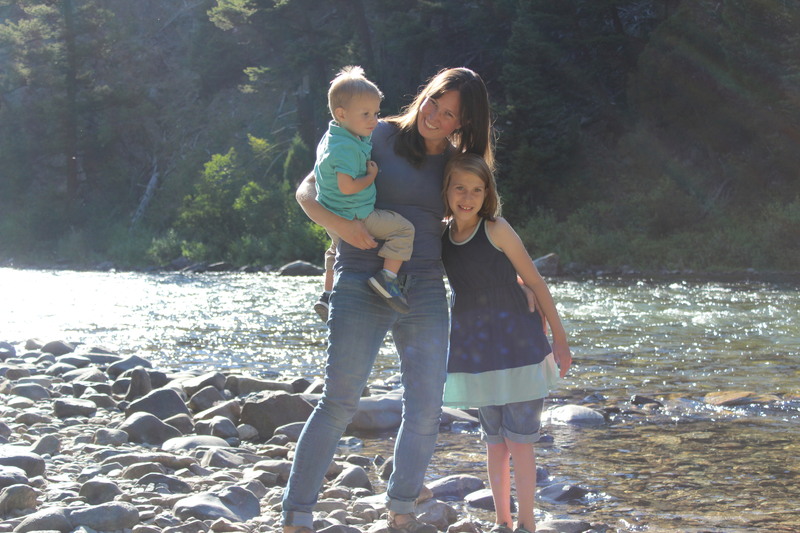 Learn more here!